If we all work together we can continue to support the desperately needed animal centre. You can donate using any of the methods below and all donations are gratefully received. Please give us a call 01905 821272 for further details. The Lottery has now been launched!!!! Please share and get involved!!! This helps us as well as entering you to win prizes!! Please use our Virgin site for any Special Welfare Appeal we are currently running or to just donate to support our valuable animal welfare work. You can also set up a direct debit as a regular donation. Please always leave a comment as to how you would want your donation to be used. Your support makes a difference and we are always gratful for the acknowledgement of our work. 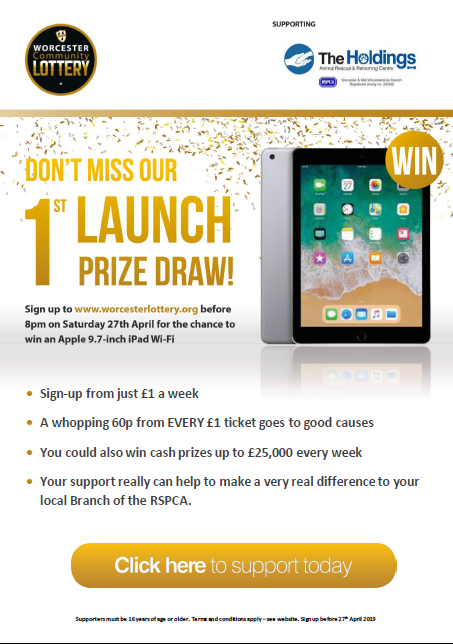 You can now fundraise for the RSPCA Worcester and Mid-Worcestershire branch by shopping online too! By shopping through the link below a percentage of your total purchase cost will come directly supporting our animal welfare work. (This is at zero cost to yourself..). Shop to Stop Animal Cruelty - every time you shop online with us you'll be supporting our work rescuing and rehabilitating animals. A new range of food and accessories for dogs, cats, guinea pigs, rabbits and wildlife. All food recipes have been devised in consultation with RSPCA animal experts and are used in RSPCA animal centres so you can be sure of the quality. Charity gifts - send a personalised card with a donation to the animal welfare cause you choose. Personalised cards - a general donation to the RSPCA with a personalised card or ecard printed with your own message. Gifts for animal lovers. For all creatures great and small. "I give.............to the Royal Society for the Prevention of Cruelty to Animals Worcester and Mid Worcestershire Branch, registered number 205930 and I declare that the receipt of the honorary treasurer or other proper officer of the said branch shall be a full and sufficient discharge for the said legacy." Again, if you have any questions, please contact us for further details.